Happy Friday!! 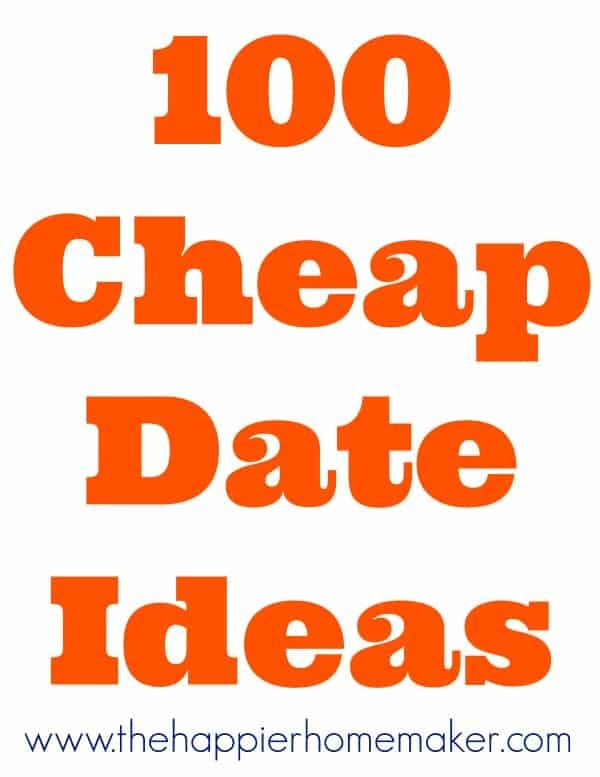 In the spirit of weekend fun I’ve compiled a list of 100, yes 100, fun and cheap dates ideas, most should be under $20 (depending on where you live.) So no excuses this weekend-go out with your honey and have some fun!! Visit a playground and play like you’re 8 again! Have an at home romantic spa night-bubble bath, lotions, you get the picture! I hope you found some inspiration in this list…did I miss any ideas? Leave them in the comments! Can some jelly!! Hehehe. That’s what we did last night, although I had to yell at him to come in from the living room and help me. It was still fun! My favorite things: Go to Home Depot and plan your next project or paint a room together! I’m so predictable… This was fun list though! Thanks for the inspiration! What a great list! Now we have no excuse! I LOVE this!! With baby on the way we need to make time for date nights!! Thanks Laura Beth!! See you in a few days!! Aw, thanks so much Jennifer!! Did I see “Exercise” on the list? I do like walking or running with J but not for date night! 🙂 He would think garage sale hopping is his own version of hell, but on the other hand, I could take him to a HS football game and he would be in heaven! haha. These are awesome!! I’m glad to find a list of so many–there is got to be at least a few things he’ll want to do with me on here!! Thank you so much!! Definitely bookmarking this and sending it to the Boyfriend Unit! What a great list! The hubs and I try and do date day or date night at least once a month and this list makes me realize how inexpensive really fun dates can be! Love it! We try to go out a few times a month if not weekly but paying for childcare for three kids gets expensive so I try to think up inexpensive dates!! These all sound really fun! I haven’t flown a kite in years so I’d love to do that with my hubby this spring.